The following programs are communication sample programs written in Visual Basic (VB) and Visual C++ (VC++)'s project format. Please refer to the User's Manual(IM 701990-01E) for detailed information, which can be extracted from "dlsample106.zip" file. Visual basic (VB) and Visual C++ (VC++) on the Windows operating system. 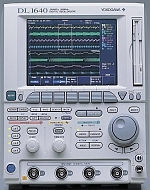 "TMCTL", which is the Yokogawa original driver software, is required to use these sample programs. Download here. A dedicated USB driver is required when using USB interface. The USB driver can be downloaded from here.